SoHo will succeed Game of Thrones with a new vehicle for one of its Kiwi stars: Roadies. The cast of this Cameron Crowe (Almost Famous) comedy about rock music’s “backstage warriors” includes Keisha Castle-Hughes, who appeared briefly in Thrones this season and last, as an outspoken and passionate sound mixer. Roadies, which will screen 8.30 Mondays from July 4, is about life on the road for a top rock band — but with the spotlight on its roadies (one of whom compares the 60-show, 43-city tour to “a Fellini film crossed with a Monkees episode”). The 10-part series also stars Luke Wilson (The Ridiculous 6), Carla Gugino (San Andreas), Imogen Poots (Need for Speed), Rafe Spall (The Big Short) and Peter Cambor (NCIS: Los Angeles). Rainn Wilson (The Office, Backstrom), who Crowe directed as a Rolling Stone editor in Almost Famous, also pops up, as another music journo. Roadies is Crowe’s first TV series and the original pilot, which he shot in 2014, starred Mad Men’s Christina Hendricks in Gugino’s role. “What I’m always looking for in a project is a great character, a vision behind it and a world that I’d be really interested in watching. And this show has all those elements,” Gugino told Variety. 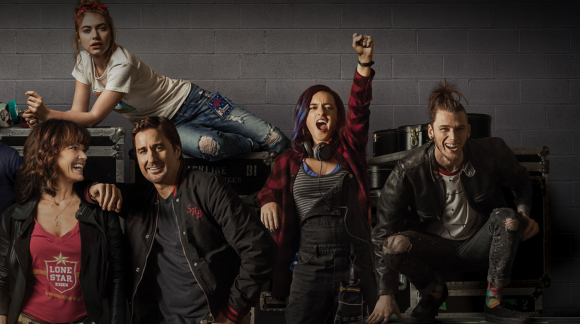 Roadies premieres on Showtime a week ahead of SoHo, on June 26.